I have been planning to try Nicolas for over a year now, and for one reason or another my visit kept being postponed. This is a very reputable restaurant which is doing extremely well, so after a few failed last minute attempts to get a reservation, I finally managed to get a seat for lunch. Nicolas has been recommended by many, and they all had good things to say about the food, so I was extremely curious to try. Located within a shop house in Keong Saik road, the restaurant is fairly small and only has a few tables in the main dining room. A long kitchen counter occupies one side of it, where the Chefs can be observed quietly focused on the food preparation. We were politely welcomed and escorted to our dining table at the far end, and Nicolas himself gave us an overview of the specials of the day. The set menu started off with raw Hokkaido scallops. These were fresh, firm but juicy just as I like. I am actually questioning whether they really are from Hokkaido, since every Hokkaido scallop I had in the past was not to my taste. Even when I went to Hokkaido and had the scallops at the fish market straight out of the shell, the texture is totally unlike these scallops. In any case, whether they are from Hokkaido or not, these were absolutely wonderful. 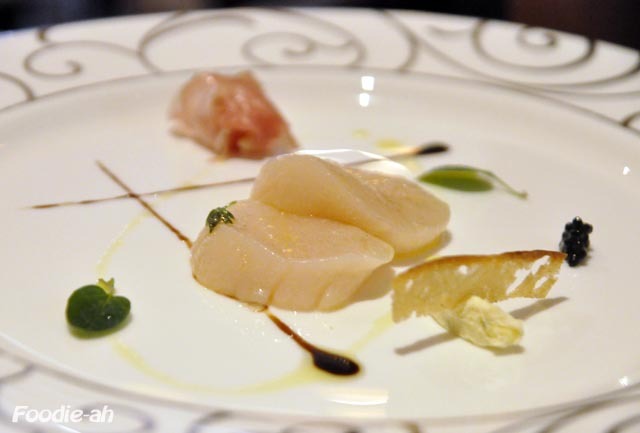 The thin slice of cured ham on the side was also outstanding, adding a little salty contrast against the sweetness of the scallops. The second starter was a red prawn, accompanied by its bisque and ravioli. All three were a pleasure to the palate. I am usually not too keen on eating prawns, as they tend to be dry and tasteless (especially here in Asia), but this prawn really felt like what prawns should be about. The lardo di colonnata wrapped around it formed a tasty layer of fat which brought out the flavour of the prawn. The bisque was a foamy, creamy prawn flavoured soup and I could subtly taste the roasting of the shells. 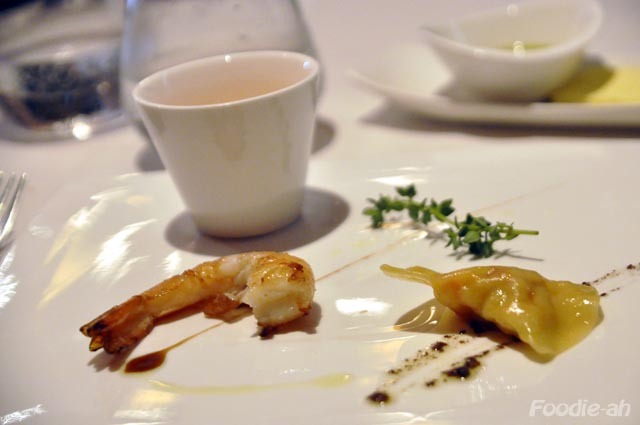 The ravioli had a thin, almost wanton like skin, wrapped around chunks of prawn. 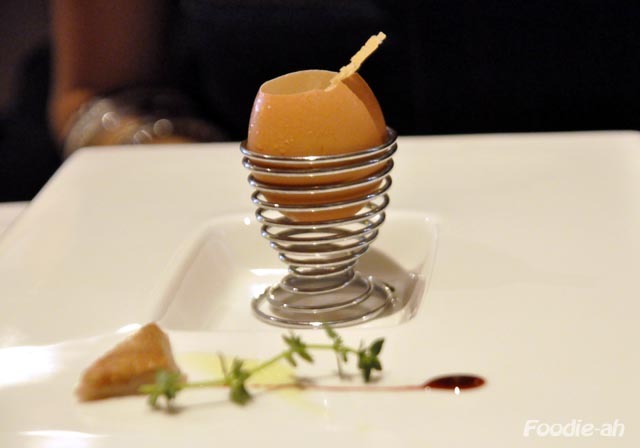 The hen egg was lightly steamed and flavoured with truffle oil. I liked the soft little triangles of pork which decorated the dish. 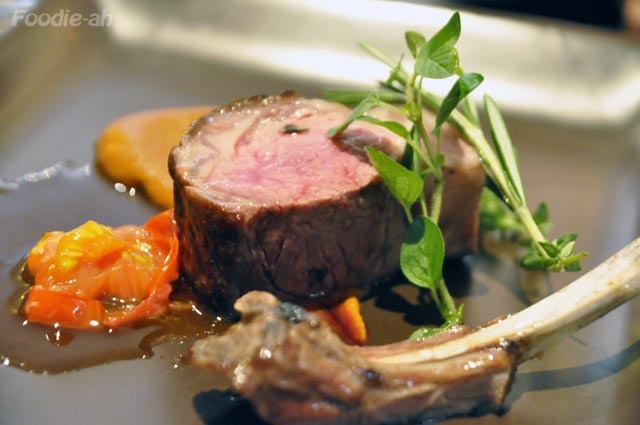 Excellent the rack of lamb, served with its own juices. The meat was medium rare throughout, lightly crisped on the surface, accompanied by a subtly smoked red carrot pureé. 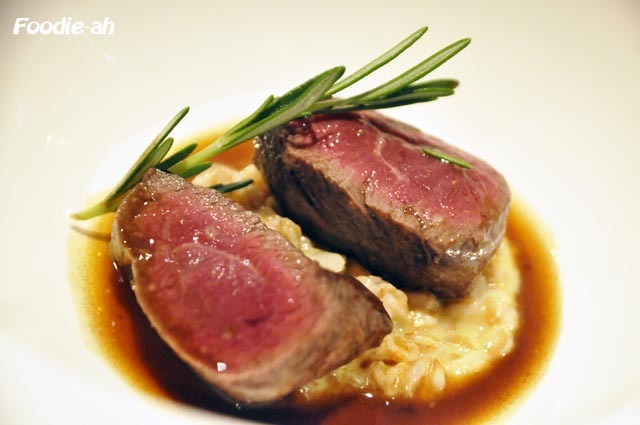 The daily special was a rather rare venison, succulently tender and served on a bed of tasty barley risotto. I loved the texture of the barley much more than I would enjoy rice. The cooking juices brought together the flavour of the lamb and the risotto. I must say that Nicolas fully lives up to its reputation of a restaurant where both service and food are done at their best. At S$68++, this lunch was well worth its price, and I am looking forward to try their dinner menu soon. Nicolas' food is sophisticated French that intentionally does not push the boundaries of creativity (as some of the nouvelle cuisine can do) in order to remain truthful to the tradition, while lightening and refining flavours for the modern, cultured palate. Oh my! Looks like I've no choice but to dine here next weekend! Dave's fav restaurant right? Just made reservation for sat's dinner. And then I suddenly remembered Gattopardo! ...so which one are you going for? You know Dave? Just emailed Gattopardo with my budget. ps : yes, i know Dave from 2010's Annual food blogger dinner. saw u there too! i was at the other table, next to Julia.